*Today is the last day to enter my SH Bling in the New Year mini giveaway! One of the most frustrating things when shopping for polish online is not being able to see swatches beforehand. L.A. Girl is a brand typically sold at Rite Aid. I don't have a Rite Aid. Also, L.A. Girl isn't what I'd call a very mainstream popular brand (I think it needs to be though), so swatches are few and far between. Cherry Culture always has 20% off sales running, and I knew off hand I wanted some of their 3D Effects and Sand Blast polishes. I then came across a new line from them called "Pop". The Pop line was further divided down into smaller sub lines glitters, brights, and so on. I spotted a crelly polish with multi-colored glitter in the Pop Color Clash line called Birthday Cake. The line is so new and since L.A. Girl polishes are so hard to come by anyways, there were not any swatches. I decided to take a gamble. 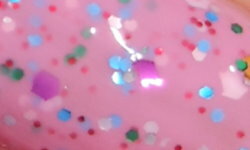 Birthday Cake is a soft cool-toned bubble gum pink crelly with multi-colored glitter. Color: I'm sure your'e wondering how this might compare to Claire's Candy Shop? Check out KellieGonzo's swatch of the Claire's one. They're different. I think the L.A. Girl one is better. The base is creamier, more opaque, and I think it's more flattering shade of pink. The glitter is much more sparse and smaller though, but I prefer it that way. Formula: The formula on this was OK, it was sheer at first, but built up nicely in 3 coats. Price: This is $4.00 on Cherry Culture. I would wait until they have another 20% off sale though, they have them all the time. If have a Rite Aids near you, check there! Overall: I love Birthday Cake! This is just one of the girly and fun colors that puts a smile to your face. I love the color of the glitters in this. Pinks can be hard for me to pull off with my skin tone, but this shade is very flattering. I'm a fan, it worth the gamble. I used to own Claire's Candy Shop and I sold it in my blog sale because the base was too sheer for my taste. 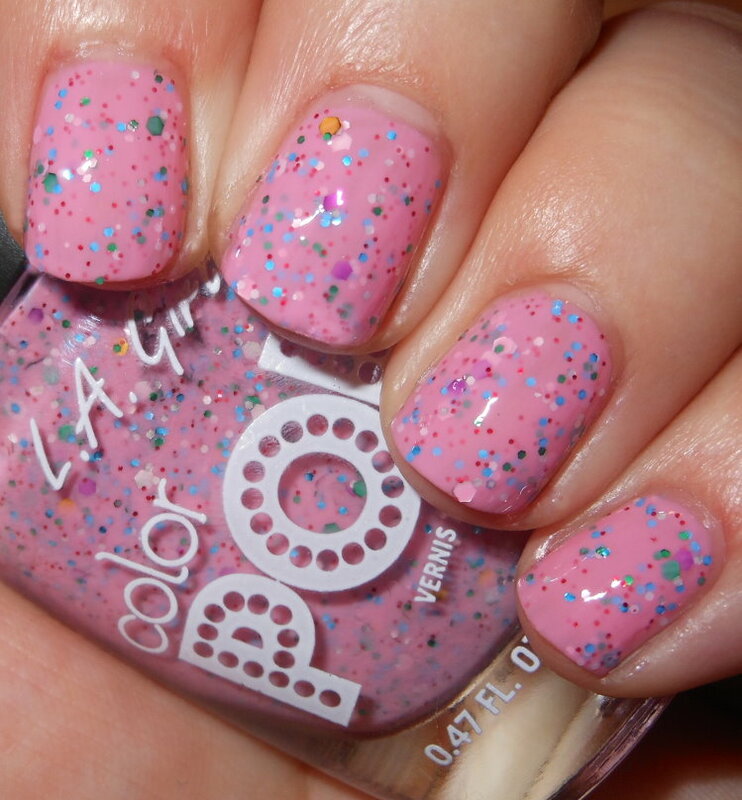 I love that this one seems more creamy and opaque - I needed 4 coats for opacity with Candy Shop! This is a really cute polish! I actually like the look better than Candy Shop too, even though that one is pretty nice as well. This glitzy pink is my type of polish :) I don't have Rite Aid here, either. Oooh!! I haven't seen this one. It's really pretty!! I really like this! I wonder how it compares to the new kbshimmer polish Merry Pinkmas. Thanks for swatching this. I always see this brand at my TJMaxx and always been afraid to take a gamble on them. I might actually pick up some next time!